occupation – identify by an occupation or rank (black smith = Smith). combining as Old English hramsa dæl to give 'wild garlic valley'. Hyoscyamus niger, commonly known as henbane, black henbane or stinking nightshade, is a poisonous plant in the family Solanaceae which can be found growing on the North Yorkshire moors and hills. Henbane was historically used in combination with other plants, such as mandrake, deadly nightshade, and datura as an anaesthetic potion, as well as for its psychoactive properties in "magic brews" These psychoactive properties include visual hallucinations and a sensation of flight. It was originally used in continental Europe, Asia, and the Arab world, though it did spread to England in the Middle Ages. Henbane ingestion by humans is followed simultaneously by peripheral inhibition and central stimulation. Common effects of henbane ingestion include hallucinations, dilated pupils, restlessness, and flushed skin. Over-dosages result in delirium, coma, respiratory paralysis, and death. Low and average dosages have inebriating and aphrodisiac effects. Henbane leaves and herbage without roots are chopped and dried and are then used for medicinal purposes or in incense and smoking blends, in making beer and tea, and in seasoning wine. Henbane leaves are boiled in oil to derive henbane oil. Henbane seeds are an ingredient in incense blends. In all preparations, the dosage has to be carefully estimated due to the high toxicity of henbane. For some therapeutic applications, dosages like 0.5 g and 1.5 - 3 g were used. The lethal dosage is not known. 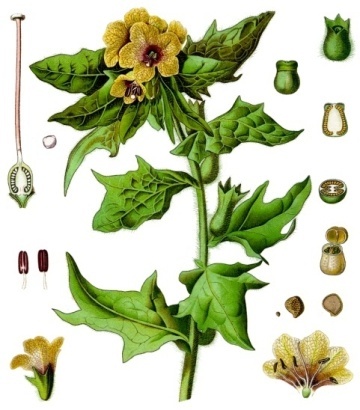 Henbane is toxic to cattle, wild animals, fish, and birds. Not all animals are susceptible; for example, the larvae of some Lepidoptera species, including cabbage moths, eat henbane. Pigs are immune to henbane toxicity and are reported to enjoy the effects of the plant. In 1917 henbane seeds were found in a Viking grave unearthed near Fyrkat, Denmark. Given that crushing and rubbing henbane petals onto the skin provides a numbing effect along with a mild sensation of flying, this finding has led to the theory that henbane, rather than mushrooms or alcohol, was used to incite the legendary rage in berserkers. Old Norse 'hrafn' (a raven) (hrafns, genitive singular) traced back to, and often spelt, hramn (hramns) according to the morphological rule after which 'n' becomes 'r' after 'm', giving hramns dalr ('ravens valley'). Cognate with Old English hræfn (raven) and Old Saxon hravan. the surname Ramsdale derives directly from the Norse place-name Raumsdalr (the valley of the river Rauma in the counties of Oppland and Møre og Romsdal in Norway - modern: Romsdal) an eponym after "Raum the Old" (Old Norse: Raumr inn gamli), son of King Nór, legendary founder of Norway who may have been descendants of the ancient Gothic "Raumii" tribe. Raums Dale is the modern district of Romsdal in the county of Møre og Romsdal. Raum was said to have been ugly, as was his daughter, Bryngerd, who was married to King Álf. Indeed, in Old Norse, raumr means a big and ugly person. Raumar, m. plural the name of a people in Norway: Rauma-ríki, n. a county in Norway: Raums-dalr, m. the present Romsdalen: Raum-dælir, m. plural the men from Raums-dalr: Raum-elfr, f. the river Raum in Norway, Fornmanna Sögur: Raumskr, adjective from Romsdalen, Fornmanna Sögur. ii. 252.
raumr, m. a giant, Titan, Edda (Gl.) 2. a big, huge, clownish person, Fas. ii. 384, 546, Skíða R. 51. Raumar, m. plural, the name of a people in Norway: Rauma-ríki, n. a county in Norway: Raums-dalr, m. the present Romsdalen: Raum-dælir, m. plural, the men from R.: Raum-elfr, f. the river Raum-elfr (Raumelfr 'Raum river') in Norway, Fornmanna Sögur: Raumskr, adj. from Romsdalen, Fornmanna Sögur ii. 252.
raumr, m. a giant, Titan, Edda (Gl.) 2. a big, huge, clownish person, Fornaldar Sögur ii. 384, 546, Skíða R. 51.
raumska, að, modern rumska, to say hem! in awakening, Fornaldar Sögur iii. 11. "Álfheim, at that time, was the name of the land between the Raumelfr ['Raum river', lower parts of the modern Glomma river] and the Gautelfr ['Gaut river', the modern Göta älv]." The words "at that time" indicates the name for the region was archaic or obsolete by the 13th century. The element elfr is a common word for 'river' and appears in other river names. It is cognate with Middle Low German elve 'river' and the name of the river Elbe. The Raum Elf marked the border of the region of Raumaríki and the Gaut Elf marked the border of Gautland (modern Götaland). It corresponds closely to the former Norwegian province of Bohuslän, now in Sweden. The name Álfheim here may have nothing to do with Álfar 'Elves', but may derive from a word meaning 'gravel layer'. However, the Saga of Thorstein, Viking's Son claims that the two rivers and the country was named from King Álf the Old (Álfr hinn gamli) who once ruled there, and that his descendants were all related to the Elves and were more handsome than any other people except for the giants, a unique and possibly corrupt reference to giants being especially good looking. The Sögubrot af nokkrum fornkonungum also mentions the special good looks of the kindred of King Álf the Old. Álfr hinn gamli: in proper names, hinn Gamli is added as a soubriquet, like 'major' in Latin, to distinguish an older man from a younger man of the same name; hinn gamli and hinn ungi also often answer to the English 'father and son'; thus, Álfr Gamli and Álfr Ungi, old and young. tend to be associated with Lancashire and Yorkshire. The most probable source of the surname is Ramsdale Hamlet in Fylingdale's Parish, North Yorkshire [NZ 927037]. This parochial chapelry lies south of Whitby parish and contains the villages of Robin Hood's Bay and Thorpe, or Fyling Thorpe (Presterthorpe, 13th century), and the hamlets of Normanby, Parkgate, Ramsdale, Raw (Fyling Rawe, 16th century), and Stoupe Brow. Place-names on the North Yorkshire coast ending in -dale, -by and -thorpe (eg Whitby, Ramsdale, Fyling Thorpe) are indicative of settlement by Norwegian adventurers in the ninth century AD who had joined Danish Vikings in subjugating the whole of northern England (the Danelaw) before settling there as farmers and traders and developing great mercantile cities such as York. The actual derivation of the surname will likely only be discovered through improved Y-DNA testing of males of the Ramsdale surname to more accurately determine their paternal line. Ramsdale - the consolidated chapelry of Ramsdale, in the parish of Tadley, Overton Hundred, Hampshire. Some of these surnames could conceivably have arisen because an ancestor travelled away from his home region during the period of surname formation, so the principal modern-day heartland of the family could therefore be in that new settlement area rather than the area of origin. Studies have shown, however, that overall more than half the surnames in Britain still have a statistically significant association with a particular locality. Toponymic surnames are relatively more common in the parts of Britain that are sparsely populated with scattered farmhouses rather than larger settlements, for example in the far north and the south-west of England. Like all surnames, toponymic surnames can "mutate" when name bearers change their locality, their name then being pronounced differently and leading over time to a change of spelling. Some modern surnames are unrecognisable abbreviations of familiar places e.g. "Deadman" being a contraction of "Debenham", a village in Suffolk. Given that toponymic surnames are so specific in their origin, logic suggests that many of these surnames will probably have a single common ancestor at their head. Accordingly, DNA tests on modern-day name-bearers should reveal that they have identical or very similar DNA signatures. … In several cases, perhaps in a majority, if we knew the actual facts, the prefix is a proper name. The Norse invaders originally gave their name to the place where they settled; in more recent times, families took their name from the place where they lived. Thus some Scandinavian warrior gave his name Griner to Grims-ttina, and subsequently the owner of the soil, possibly a descendant, called himself "de Grimston", which passed into a surname, and is one of the most ancient in the East Riding. Griner was a name of Odin, and the word occurs in many compounds, e.g. Thor-grimy, Hergrintr, Hallgrimr, Grin/ken, Grimhildr, &c.
The second common type of surname is that derived from a topographical feature in the landscape. These arose in the same way as toponymic surnames, but because they tend to describe a general feature rather than a specific location e.g. Brook, Green, Hill, Wood, it is generally assumed that they must have arisen in many places across the country independently of each other. Recent developments in surname studies (Surnames and Genealogy: A New Approach, Dr George Redmonds) demonstrate that some topographical surnames are toponymic i.e. they are linked to a specific location rather than to a general landscape feature e.g. the relatively common surname "Sykes". Given that topographical surnames are likely to have arisen in many different places across the country, it is to be expected that DNA results of men bearing one of these generic surnames should reveal its multiple ancestor origin. Argent (Ar'-jent): White. The silvery colour on coats of arms. In the arms of princes it is sometimes called lune, and in those of peers pearl. In engravings it is generally represented by the natural color of the paper. It represents purity, innocence, beauty or gentleness. Chevron (shev'-ron): One of the honourable ordinaries. It is rafter shaped, and its breadth is one-fifth of the field. Fleur-de-lis (flur'-de-lee): Heraldically this is a flower, and stands at the head of the flowers of heraldry. Its origin is unknown, one "authority" claiming that it was brought down from heaven by an angel for the arms of France. It is also said to mean the flower of Louis (Fleur de Louis), and was certainly used by Louis VII. It is undoubtedly the "flower of the lilly." Originally the royal banner of France was seme of lis (completely covered with fleur-de-lis); but from the time of Charles VI it has consisted of three golden fleur-de-lis on a blue field. The fleur-de-lis did not at first meet with much favour in England, and did not become popular, in fact, until its assumption by Edward III. The French quartering in the English royal arms was abolished by George VI on his accession. When used as a difference the fleur-de-lis represents the sixth son. Sable: The tincture black. In engraving it is represented by perpendicular and horizontal lines crossed. Couped (koop'd) Said of an animal having the head or any limb cut clean off from the body. When a specified number of charges is immediately followed by a similar number of other charges the words "as many" may be used, e.g. Argent, on a chevron between three fleurs-de-lys sable, "as many" rams' heads couped at the neck of the first (Ramsdale), and Argent on a Chevron Gules between three Leopard's Faces Sable "as many" Castles Or (de Sausmarez).